Any ‘uninformed’ reader of this fairly brief report in the Walthamstow Guardian Newspaper might understandably assume, from the title of ‘First in Public’ that the MDC had not presented anything prior to this date – or at least not with an audience etc! This is not, of course, wholly accurate – as the previous three years had seen at least three major productions at the school and a good number of appearances in the Essex Youth Drama Festivals and the Walthamstow ‘Youth Speaks’ Competitions. However, to be fair, it may be that the reason for using this title is explained in the opening line that refers to ‘The Drama Class of the Marsh Street Youth Centre being the ‘THE BRUNSWICK PLAYERS’ – which might give some clue to this apparent difference of opinion about the club’s history – perhaps this just being an assumed name for this presentation? However, the report importantly fills in bit more detail of the MDC history and, at this early stage in its life, interestingly comments on the accent being on ‘comedy’ – of which, of course, there was a good deal more to follow in the ensuing years! 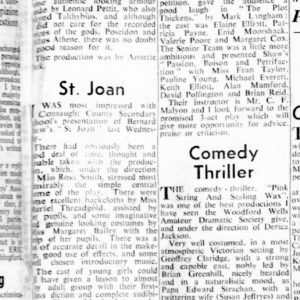 The other interesting parts of the report are in its reference to the earlier, and successful, participation in the ‘Youth Speaks’ competition and of the reprise of ‘Poison, Passion and Petrifaction’ – itself a competition winning entry in the 1958 Essex Youth Drama Festival – with some of the original cast! The Senior team were a little more ambitious and presented Shaw’s ‘Poison, Passion and Petrifaction’ with Miss Fran Taylor, Pauline Young, Michael Everett, Keith Elliott, Alan Mumford, David Pollington and Brian Reid. Their instructor is C.F.Malyon and I look forward to the promised 3 Act Play which will give more opportunities for advice, praise or criticism. Any clues as to the reasons for using the title of ‘The Brunswick Players’ will be gratefully received!! !